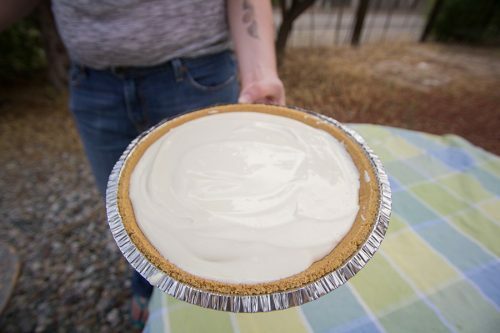 Thanksgiving is tomorrow, which means you need recipes! I am here to provide a few. Click the links for the recipes. Alternately, all the recipes are listed here. 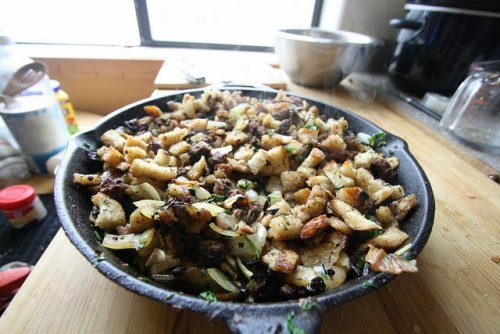 Sage sausage stuffing with sourdough bread. Stuffing before being placed in the oven. Although cast iron is great for baking, it tends to burn the bottom of the stuffing. Glass is preferred. 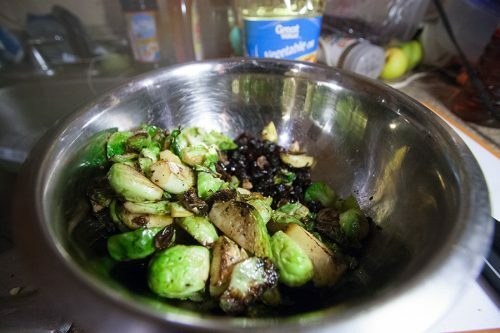 If the skillet isn’t large, cook the sprouts in batches. Dump cake with non-dairy whipped topping, which looks like ice cream. 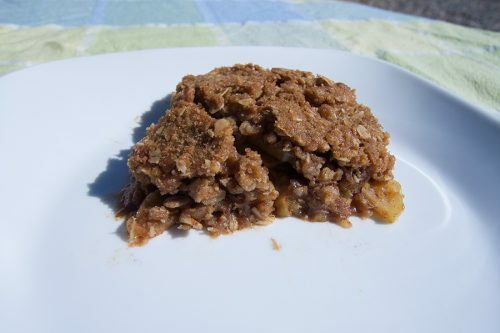 For this dish, consider using the pumpkin mixture recipe in the dump cake. 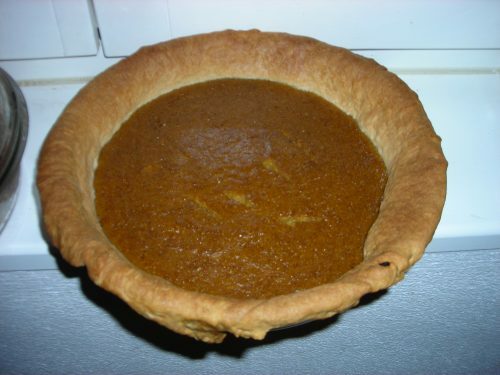 Pumpkin pie after being baked. It’s the pie! Pre-freezer, though. The boozy apple crisp is good. Not amazing, but good. Really, just choose any dessert. 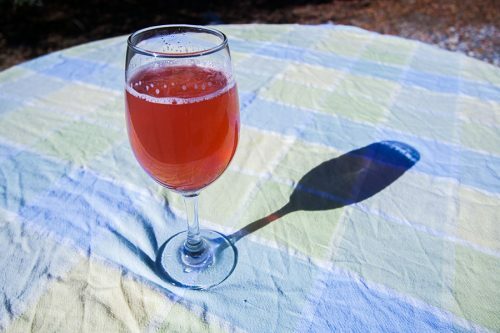 Cranberry juice and sparkling wine make a great combination for those who do not like the bubbly by itself. 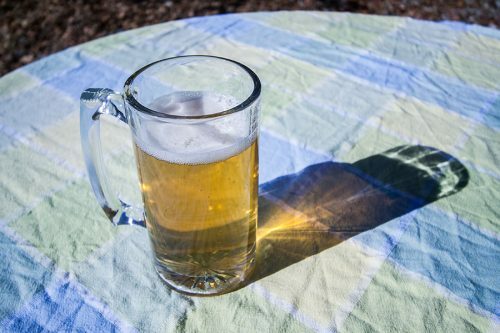 The ginger beer shandy casts a pretty shadow. Way too hot. My bad! No boiling allowed! I’m a big fan of the apple crisp. That should come as no surprise, considering I written about two crisps/hybrids and consistently use the crisp (aka crumble) topping as a basis in other recipes. There’s the original, double sided crisp which is just a crisp on both the top and bottom and then there’s the hybrid cobbler crisp with raspberries. I’ve since used the crumble/crisp topping in an apple coffee cake (the crumble/crisp is also called a streusel). It’s the search for inspiration for that coffee cake that brought me to a recipe by Monique at the Ambitious Kitchen. 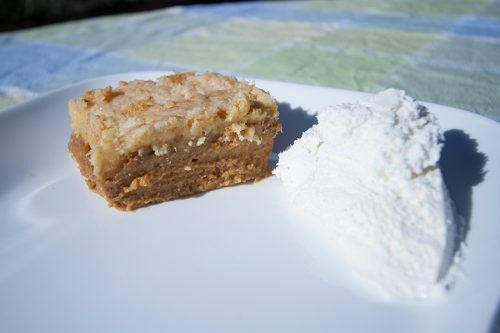 There were two things I took away from her recipe, both of which I incorporated into the apple coffee cake: the addition of liquor in the baking process and mixing the streusel topping into the middle. I recently made the Ambitious Kitchen crisp with the addition of, and more, liquor than called for in the original recipe and eliminated the nuts. I also substituted my streusel topping for hers, which I found to have too much sugar. Finally, I used semi-sweet apples from my co-worker’s orchard. Finally, I didn’t deal with the the vanilla bean the recipe and conceded to the use of butter on the apples. I don’t know that it added anything and I found the apples needed a bit more sugar. My last note is that it really does need to be heated back up before serving and it might actually be better a day later, after being reheated. Preheat oven to 350 degrees F. Grease a 9×13 pan. Peel the apples if desired. Cut the apples into very thin slices. Melt the butter for the streudel topping. In a medium-large bowl, mix the bottom’s melted butter, brown sugar, flour and, if using them, spices. Mix in the oats. 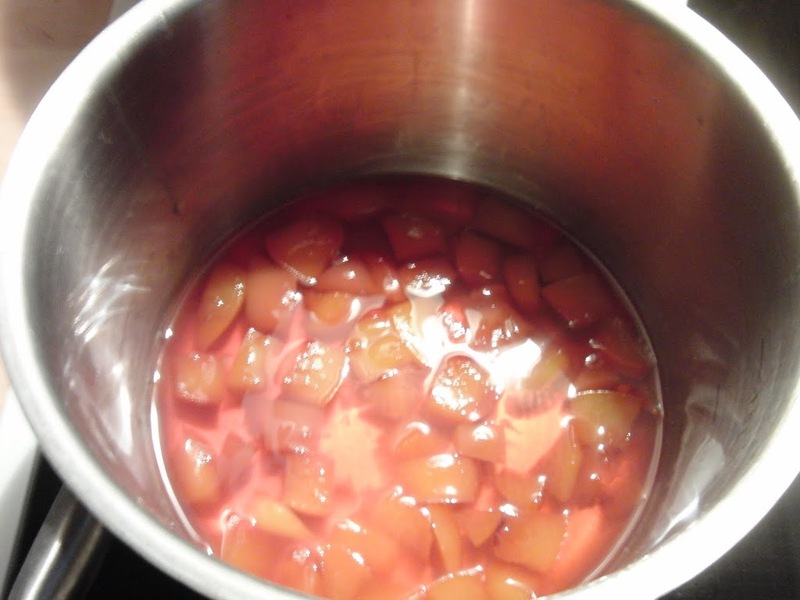 Place the apple slices, the 1/3 to 1/2 cup brown sugar, cinnamon and liquor in a very large bowl and toss to combine. Take 1/2 cup of the streudel topping and mix it into the apples. Pour the apples into the greased pan. Cover the apples with the rest of the streudel mixture and lightly pat down. Either put the pan on a baking sheet, or put it directly in the oven, and bake for 50 minutes to 60 minutes (an hour). This spiced apple crisp, baked with booze, gets better after the first couple of days. Serve warm or hot. See, use, whatever you want, because all the photos are here on Flickr. Note: This post originally ran on my blog from many years ago, wheeleringermany.blogspot.com. I posted to and updated it during some of my tenure as an au pair in Dresden, Germany. I invited my former Volkshochschule classmates to the house for dinner on Saturday night. The family was out for the weekend; I had the entire place to myself. Only Ingrid, a classmate from Columbia, replied. She brought her husband and son along. We started out with a beef stew made with a ¾ to ¼ red wine to water base. As a side I’d roasted Kohlrabi. However, in trying to keep them warm I managed to burn most of them to a crisp. Note to self: don’t leave Kohlrabi in the oven while baking anything else. Also, I learned NOT to use sea salt on roasted kohlrabi. The sea salt adds too much saltiness in too little space. Ingrid’s husband seemed to like them though; we had an entire conversation revolving around Kohlrabi. It’s a cousin of the turnip. I’ll write its recipe later. I also picked up .40 Euro cents garlic bread baguettes. Quite delicious by themselves and go great with the beef stew. After the stew we moved on to a “Bavarian Apple Torte,” which did not turn out as planned, and brownies coupled with the subject of this recipe: a syrupy wine-fruit sauce. As I wrote, brownies. Gotta love ‘em. The definition of a perfect brownie changes from person to person. To me, perfect is on the just-cooked, fudgy side; the cake side is reserved for cake. However, this recipe is not for brownies. 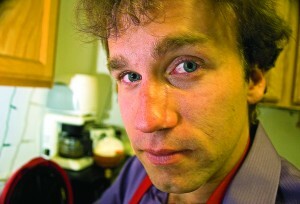 It’s for a sour, sucker-slapping syrupy fruit-wine sauce that goes with, on or next to a brownie. The wine to use changes with the fruit. Peaches and nectarines go well with a white wine, possibly with a splash of red. Strawberries and raspberries go better with a red wine, possibly with a splash of white. But, ultimately, the cook should make the decision on wine-and-fruit paring. I’m no wine authority. It doesn’t hurt to remember that red wine usually goes great with chocolate. However, a glass accompanying dessert is probably better than putting peaches in a red wine sauce. Wine, wine, wine. Wine is a beautiful thing. And wine is an inexpensive thing here in Germany. I find myself using it all the time when I cook now. The not-very-good tasting wines are downright cheap. They’re close to the price of organic milk, if not cheaper in some cases. I used terrible-for-drinking (and downright cheap) boxed wine for the sauce. Not space-bag boxed wine but honest-to-god, wine in a box. Much like milk comes in a 1-liter container, so does crappy wine. It cost under a euro. 9.5% alcohol content. The sugary taste of the sauce gets both chopped down and spiked with the lime. I’m very much a chocolate and fruit person, so this recipe is love to me. The sour, with the wine, really brings a new taste to the brownie. My personal favorite matching is raspberries with anything chocolate. When I made this with nectarines and juice of about ½ a lemon it contrasted beautifully with the sweetness of the brownie. Ingrid’s husband and I were in love with the combination. Ingrid and her son didn’t like the sauce because of the sour. I loved the sour. The recipe and pairing are, alas, not for everyone. The recipe calls for boiling or cooking/reducing the wine to about half of where it was. One can reduce it more, or less. The alcohol taste was gone from the sauce when I called it quits on reducing. I’ve yet to work on presentation. You’re on your own for that. This recipe/concept came (to me) from a fellow expat who’s living on an Army base here. In a previous life she cooked professionally. We’re in good hands. In either a deep sauce pan or a small pot add 2 cups of chosen wine. 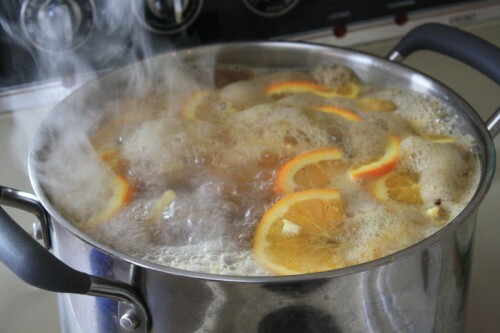 Bring to a boil, mix in the desired amount of sugar until its dissolved and half the fruit. Boil or cook/reduce the sauce until it’s about half the amount it was before boiling. The previously strong (warm/hot) alcohol taste should be gone. Add the rest of the fruit and serve with the brownies or other dessert.